The Bicycle Friendly Community Award (BFC) Program provides incentives, hands-on assistance, and award recognition for communities that actively support bicycling. The BFC Program was launched by the Share the Road Cycling Coalition in Canada in August 2010 in partnership with the Washington based League of American Bicyclists. In Canada, the Canadian Automobile Association (South Central Ontario) is the major sponsor of the program, with additional support coming from Trek Canada. Communities complete a thorough application and are judged in five categories often referred to as the Five “ Es": Engineering, Education, Encouragement, Enforcement, and Evaluation & Planning. A community must demonstrate achievements in each of the five categories in order to be considered for an award on the Bronze, Silver, Gold or Platinum or Diamond level. Applications are judged by a volunteer panel of expert judges and communities with more significant achievements in these areas receive higher awards. The BFC application is a great self-assessment tool, as communities see where they can improve in each of these categories. The Fall 2018 application round for BFC awards saw some exciting developments for the program. New BFCs Norfolk County, The Town of Essex and the Town of Saugeen Shores demonstrated the value of perserverence when it comes to the BFC Program - with all 3 communities having previously applied and received Honourable Mentions in the past 2 years. Each community received the feedback generated by our panel of expert judges and set to work to make cycling in their communities safer and more accessible, and were ultimately successful in their new applications in 2018. 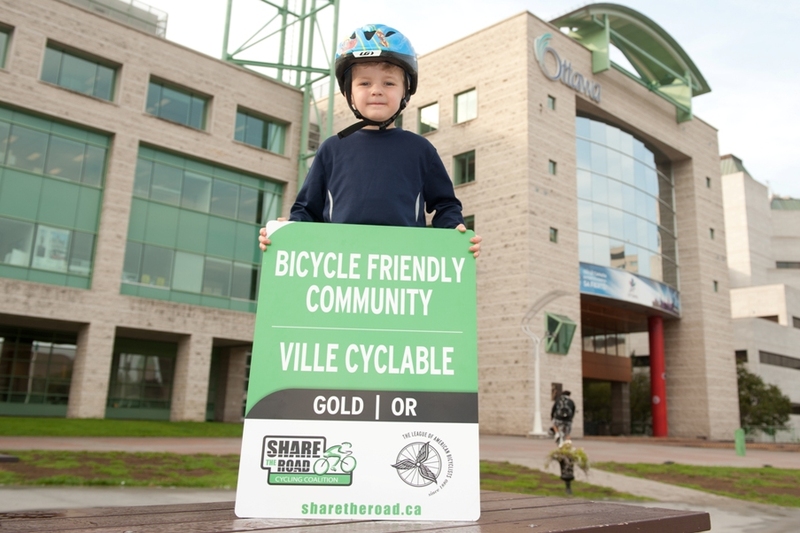 The Fall 2018 round also showed that Share the Road's BFC Workshops continue to be an excellent tool for communities to build a stronger culture of cycling, with the Town of Saugeen Shores using their 2016 Workshop as an opportunity to create the foundation of an application, and using the resulting workplan to set themselves on a path to achieve their new Bronze BFC designation. The City of Guelph and The City of Hamilton renewed their Silver designations, The Town of Halton Hills and the City of St. Catherines' renewed at the Bronze level, with Haliburton County and the City of Brantford receiving Honourab The continued growth of the BFC Program in every area of the province and among communities of every shape and size shows the strong interest in cycling all across the province, and bodes well for the future of the program! The Spring 2018 round of Bicycle Friendly Communities awards were announced at the 2018 Ontario Bike Summit. For a Press Release about the most recent awards, click here. If you are interested in applying for the BFC program, the next round of applications will close on June 28, 2019. To receive announcements about the deadline without beginning an application, please email [email protected] to be added to the contact list for all BFC updates. To begin your application, check out the Getting Started page. If you have would like to log in to the Bicycle Friendly Communities application page, click here to login with an existing account, or click here to set up a new application. Please contact [email protected] if your community should have any questions. You can also find the Frequently Asked Questions section about the BFC Program HERE. To view past BFC yearbooks, click here.